Our industrial advisory board had it's annual meeting in August 2015. This year the group discussed a new proposal for an industrial mentoring scheme for the second year software engineering course (COMP234) which will start in Semester 2 in February 2016. We're looking for technical mentors from industry who can guide small teams of students 2-3 times per semester. Find out more (and sign up) at cs.manchester.ac.uk/industry/mentoring. Around 30 students completed summer internships, some as part of the MEng programme. 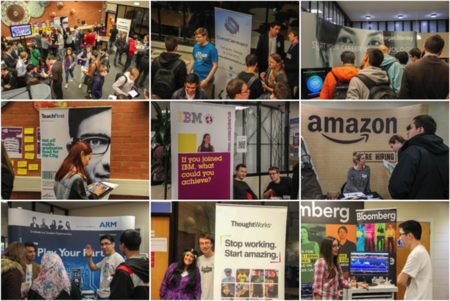 Employers of summer internship students in 2015 included American Express, ARM Holdings plc, Barclays Investment Bank, the BBC (@MediaCityUK), canddi.com, Cisco Systems, CreditSuisse, digitalbridge.eu, Google (and also the Google Summer of Code), JP Morgan & Chase Co., Kokoon Technology Ltd, moBck, Inc. (USA), Next-Stream.com (Bulgaria), the University of Manchester, Vaultex UK & Web Applications UK. Placements & Internships starting summer 2016. A group of undergraduate students from Manchester organised Hack Delhi in July 2015 in India, which is possibly the first event of its kind on the Indian subcontinent. Winning teams at HackDisrupt in London, for IFBet (betting automation software). For this academic year, a group of undergraduate students have been organising several events as part of Great Uni Hack: GreatUniHack.com. A Local Hack Day took place in Manchester on October 10th 2015 as "warm up" event for two further events on the 5th to the 6th December 2015 and the 5th to the 7th March 2016. The December event was sponsored by Web Applications UK, WA:UK Tech Angels. CDL Software, Team Netsol, Bloomberg, JustGiving, Magma Digital and Goldman Sachs. Great Uni Hack are seeking sponsors for all their March event and have a range of sponsoring options available, contact Mihai Bujanca for details. Recently, we've had undergraduate guest lectures from Apadmi, the University of Bristol, NCC Group, the BBC, Morgan Stanley, IBM, CodeThink, American Express, Web Applications UK, Network Rail, ARM, Imagination Technology and the Hut Group. We are always looking for good speakers who can engage large groups of students on interesting topics that they care about and relate to Computer Science. If you know any potential speakers, that can talk about subjects we don't already cover please let Duncan Hull know. There are a limited number of guest lecture slots (around 20) which run through term-time starting on Thursdays at 11am in November and finishing in May. Its important that the lectures are more than just a sales pitch for an organisation, they should have some content that relates to the (very broad) syllabus of COMP101. In addition to guest lectures, the school hosts a series of research seminars on Wednesday afternoons at 2pm that have covered a wide range of topics. The Annual IET / BCS Turing Lecture will return to Manchester in February 2016 and will be delivered by Bob Schukai, Head of Advanced Product Innovation at Thomson Reuters, on the "Internet of Me: its all about my screens" . This follows on from the 2015 lecture by Robert Pepper from CISCO on The Internet Paradox: how bottom up beats command and control. In addition to central university careers fairs held in June (Armitage Centre, Fallowfield) and September (Manchester Central), the 2015 Kilburn Careers Fair took place on Thursday and Friday the 22nd & 23rd October 2015. Thirty exhibitors were present over the two days including Amazon, Apadmi, ARM, Astra Zeneca, Bloomberg, Couchbase, Cyberscience, Free Agent, Goldman Sachs, Imagination Technology, IBM, Interactive Intelligence, LCH Clearnet, Morgan Stanley, NCC Group, Ocado, Portswigger Web Security, RentalCars.com, Shell, Digital Bridge / Shortbite, The Hut Group, ThoughtWorks, TopCashBack and Ultra Electronics. The 2016 Kilburn Careers fair is scheduled for October 2016 - if you'd like to exhibit and recruit students please contact Mabel Yau. Please bear in mind that places are limited and we are always over-subscribed. We're planning a new Manchester Technology fair for March 2016, to showcase employers from the Northern Powerhouse, speak to Martin Ross if you'd like to know more. Our Annual Research Symposium was held from November 3rd to November 5th sponsored by IBM. There were over 90 presentations from PhD students in the school, covering multi-core computing, data science, ontologies, machine learning, simulation, optimisation, digital biology, mobile & distributed computing, and software engineering. This event is open to any who is interested, if you would like to attend next year (late October/ early November 2016) contact the Postgraduate Research Directors for details. For a general overview of research in the School, see the latest research newsletter from autumn 2015. If you would like to get involved in postgraduate research, for example through industrially co-supervised / sponsored projects, knowledge transfer partnerships (KTPs) etc contact our research office. With help from the alumni office, we've organised two meet the professional "speed networking" alumni events, one in February and another in November 2015. This allowed students to meet alumni who graduated from Computer Science and are now working in a wide range of organisations, large and small. This was a popular event which we plan to run again in the future, if you would like to be involved in future events like this, please contact Rosie Haynes. Many alumni from the School now work in California, particularly San Francisco Bay Area at Apple, Google, Facebook, Microsoft, Twitter, HP, Oracle and ARM as well as UC Berkeley and Stanford etc. Computer Science alumna Guari Puntambekar at Adobe has rebooted the Californian alumni group so if you studied (or are studying) Computer Science in Manchester and are now working in San Franscisco Bay Area (or just thinking about it), get in touch with Guari. We have started a new mailing list for employers and our industrial collaborators for keeping in touch. If you are an employer who would like to stay informed on future events, upcoming versions of this newsletter will be posted to the cs-industryclub mailing list - we expect to have low traffic of about two newsletters per year. You can subscribe to the cs-industryclub mailing list (by emailing the listserv@listservmanchester.ac.uk with the text subscribe cs-industryclub in the body of your message). 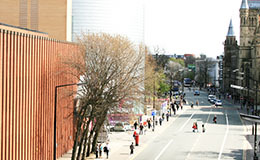 For more frequent updates, see the Monday Mail (a roundup of weekly undergraduate news) and twitter @csmcr. The School started a new podcast series in 2015, you can subscribe on iTunes or listen via SoundCloud. Recent episodes have covered Women in Computer Science, the Human Brain Project and many more topics. We hope you've had a productive 2015, and look forward to hearing from you in 2016.